Have a look at the events page for information on this year's events and reports of previous events. Highland Branch covers Highland, Moray, the Western Isles, and Orkney and Shetland. Our activities include recording butterflies and moths, organising events and field trips, and publishing newsletters, many of which you can download from this site. Roy Leverton illustrates a selection of characteristic moths to look out for in our area at different times of the year. Please click on the links below for a month by month illustrated list. The Wild Isle Projects shop on Etsy donates to BC Highland Branch, the shop can be seen on this link. Records should contain the usual what/when/where/who details, with a 6-figure OSGR. If in doubt, HBRG is happy to receive photos or specimens. Butterfly Conservation and B&Q are asking gardeners to help the UK's butterflies, bees and moths. See here for more information. This is a report that summarises the main findings of last years trials and surveys. There was good success with some new sites being found and further trials and survey work will be carried out this year. There is a shorter version of the report which relates just to the Highland branch area which will be published in the Chequered Skipper, but you can read the full report here. 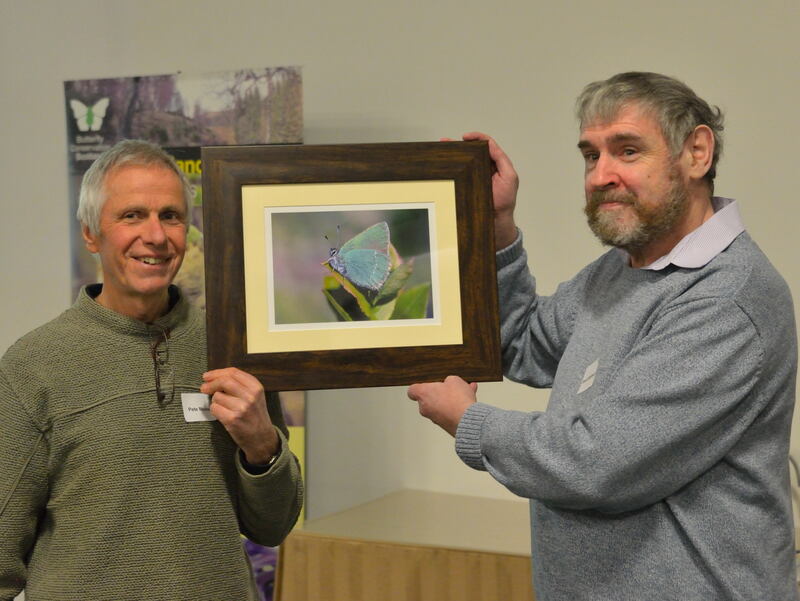 Pete Moore presenting Dr David Barbour with a print of a Green Hairstreak butterfly. David recently stood down after serving as the Highland Butterfly Recorder for 21 years. Our AGM is held on the 2nd Saturday in April, as long as that isn't Easter weekend. In 2019 the AGM will be on Saturday the 13th April and will beheld at Kingsview Christian Centre, Balnafettack Road, Inverness IV3 8TF. The AGM in 2018 was held on the 4th of April and the minutes can be read here. To contact Highland Branch on any matter relating to butterflies and moths in the Branch area, please email contact@highland-butterflies.org.uk. Enquiries relating to identification are welcome, and if you can attach a photo, so much the better. Contributions for the Latest news page can also be submitted in this way. You can also contact the Branch using the feedback form on the Contact us page. To submit records of butterflies and moths from the Branch area, including the Hebrides and Northern Isles, please send them to the appropriate Butterfly Recorder or County Moth Recorder, whose contact details can be found on the Your records page. A pdf version of our 2018 newsletter has been uploaded to the newsletter section of the website here. Although not available in paper format, this report has UK distribution maps for all resident and regular migrant species apart from Large Blue based on the most recent five-year survey of the Butterflies for the New Millenium recording scheme. Maps show distribution in each 10km by 10km grid square for 2010-2014, as well as historical records. The report can be seen here. Certain areas remain under-recorded, particularly Skye and the Small Isles, parts of Wester Ross and Central Sutherland. Anyone getting a chance to visit and record in these areas in the next two seasons could make a welcome contribution to filling in these gaps. This list aims to include every species of macro-moth reliably recorded in Scotland, with an assessment of its Scottish status, as guidance for observers contributing to the National Moth Recording Scheme (NMRS). It updates and amends the previous lists of 2009, 2011, 2012, 2014 and 2015. The WCBS is a UK-wide project looking at changes in the populations of the commoner butterfly species. Before the WCBS was set up, systematic butterfly-monitoring was often restricted to nature reserves or other good butterfly areas. While this was very useful for monitoring the rarer species found at these sites, the results of such monitoring did not produce results representative of the countryside as a whole. The WCBS was devised with the intent to rectify this discrepancy, which it does by choosing survey sites at random. Hundreds of one-kilometre squares have been randomly chosen across the country, each one waiting to be surveyed just twice a year by willing volunteers. Here in Highland Branch (i.e. Highland, Moray, Orkney, Shetland and the Outer Hebrides) we have 80 of these squares... and many have not yet been surveyed at all! Who knows what unusual butterflies might be hiding in these unexplored sites? Could you be the intrepid surveyor willing to go where no butterfly recorder has gone before? Or are you a seasoned WCBS-er wanting to continue with your existing site (or even to try a different one!)? Whichever description suits you best, please get in touch and I will furnish you with more information about the project and give you the locations of squares near you! There is also more information on our "Surveys" page here. We have been very pleased with the interest in, and the results from, the 2012 - 2014 surveys. The aim of the survey was to target recording at 100 1km squares that were predicted, through computer modeling, to be the most suitable 1km squares for the butterfly in Scotland, but where it had not previously been recorded. The Garden Moth Scheme (GMS) runs from the beginning of March to early November, with people recording the numbers of around 300 species of the more common moths in their gardens once a week throughout this period. To download a copy of the reports including Highland data, please click here. This website has been launched to make available information about the status and distribution of moths in Caithness so as to encourage greater interest in the recording of moths in the County. 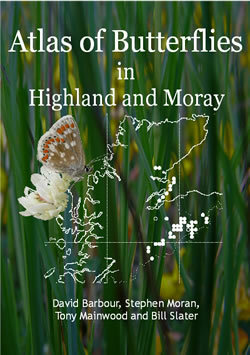 A few copies of 'Atlas of Butterflies in Highland and Moray', published in 2008 by Butterfly Conservation Highland Branch and Highland Biological Recording Group, are still available, and we're offering them at the reduced price of £1 plus £1.30 p&p please email unicorn64@btinternet.com for more information.